Out of all the different kinds of toys spy toys are some of the ones children love the most. There are so many spy kids toys available on the market nowadays we that we understand it can be stressful trying to dig through them and find the ones that your child is going to love. Well, we’ve taken care of the hard part and completed the research for you. As a result, all you need to do is have a look at our detailed guide below to learn everything you need to know about the best spy stuff for kids. The main features, advantages, disadvantages, age recommendations, and things that make the toy stand out are all included for each product. There is even a buyers guide section at the end to provide you with more information surrounding the benefits of these toys, as well as the many different kinds available. 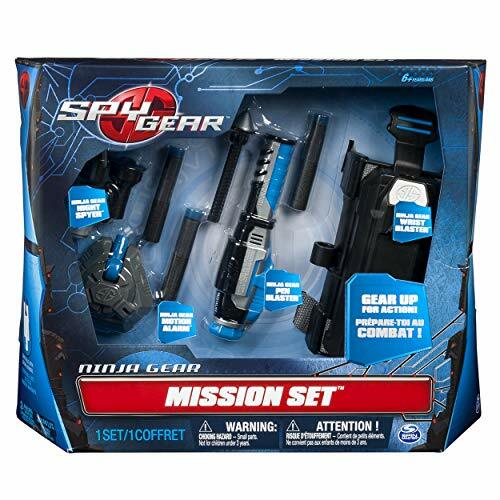 This kids Spy Gear Mission Alpha Set Bundle provides kids with plenty of options to play with. It includes a tactical mirror, night goggles, a motion alarm detector, and a special spy recording pen. When your child opens up this set, they won’t know where to begin! We liked how the night goggles have been created with LED lights built-in. This adds a more realistic effect to help kids roleplay better. Furthermore, children are able to zoom in and out for more playing options. The spy pen can be used to record various messages with. This is super fun for kids and makes them feel like an undercover spy. Moreover, this pen can be used to write secret messages too. The motion alarm detector can be placed and will be triggered if someone gets close to it. It creates a sound which is fun and audibly stimulating for kids. Kids love how many toys are available with this set as it lets them roleplay as a spy with a lot of creativity. The Spy Gear Ninja Gear Night Goggles item enables your child to see in the dark. This is a result of the fantastic LED lights that have been built-in to the goggles. They’re incredibly stimulating for your child’s visual senses and the blue tint element helps them to see with more clarity in the dark. We liked how they included a scope which can be folded out and folded back in for easier transportation. This feature, along with the 2x magnifying lens available, gives kids the chance to look way ahead in front of them at night. 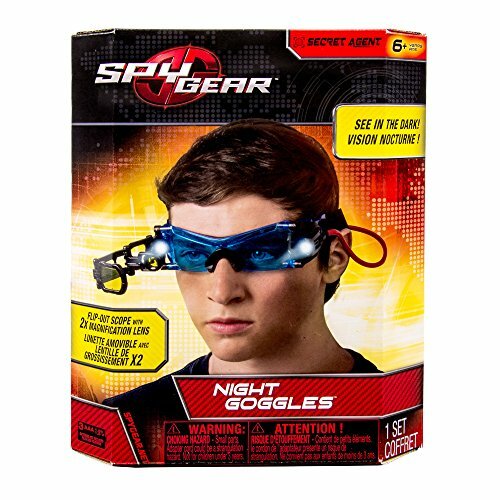 Kids love being able to see into the distance at night while playing with this spy goggle set. The foldout scope is a fun feature which is also great for coordination too. The SpyX MukikiM Micro Gear Set comes with a wide variety of toys. This includes an invisible ink pen, micro ear lights, micro listener, a micromotion alarm detector, and even a utility belt. We were impressed with how they included the utility belt as it enables kids to hold the various parts and still be able to move around with ease. This also adds to the roleplay aspect and it makes the whole set feel a lot more fun to play with. The utility belt can be adjusted to fit your child perfectly on their spy missions. The invisible pen and micro listener are super fun toys that encourage children to play with tons of creativity. Kids have been loving how they can easily clip on the various accessories onto their utility belt to carry on swiftly with their missions. It adds to the whole roleplaying effect and helps to encourage creativity. 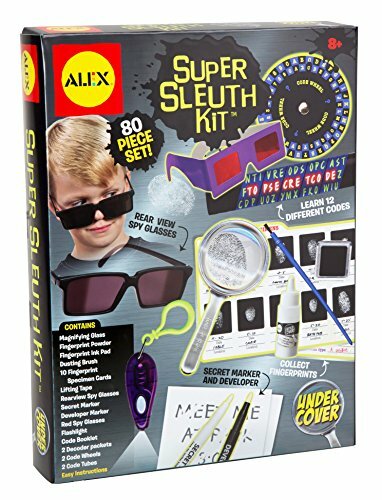 The ALEX Toys Super Sleuth Kit is an awesome playset that enables kids to develop their observation skills. This is due to the nature of the set as it teaches children how to think like a detective. This can be surprisingly educational and help your child to focus in a fun way. There are supplies for taking fingerprints, a magnifying glass, secret markers, codes, and a flashlight. Not to mention, there’s even a pair of rear-view spy glasses. These glasses help kids to play with a lot of imagination as they can wear them and feel like a real detective spy. We liked the code set aspect as it’s effective at helping kids how to learn different codes and sequences. This is great for their number recognition and basic math skills. This kids spy set makes children feel like they’re doing some detective work and it’s fantastic for roleplaying. We liked how it also helps kids to develop their observational and basic math skills. 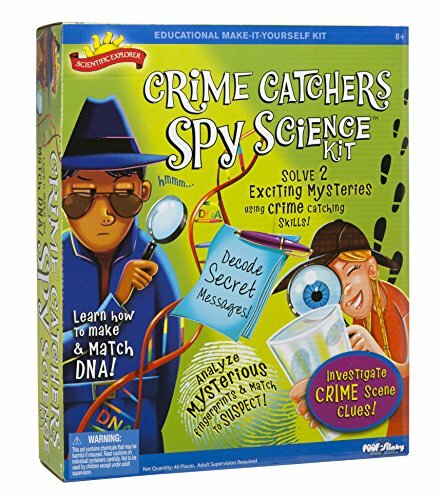 The Scientific Explorer Crime Catcher Spy Science Kit comes with an impressive total of 8 activities available. This provides your child with plenty of options to play with an be entertained for hours. Across the 8 activities, there are 2 mysteries available which kids have to try and solve. They can do this with the help of test powders, DNA and fingerprint matching, and even gaining an understanding of secret messages. All of these aspects are fantastic for encouraging kids to develop their critical thinking skills. To make the set feel realistic, the items included for all the testing kids include citric acid, baking soda, flour, filters, ph strips, cups, bags, test tubes, and a decoder. As a result, kids are able to easily roleplay and use their imaginative side. Since this one involves mysteries that need to be solved, kids can put their critical thinking hats on and get to work. The length they’ve gone to in order to make the kit seem realistic helps children to get into the role and have a blast. The Spy Gear Ninja Mission Set comes with a number of fantastic toys. This includes a spy pen blaster, wrist blaster, motion alarm detector, and a nighttime spy toy. As a result, your child is provided with plenty of options to play with for hours on end. We liked how fun the wrist blaster is to use. It can fire out toy darts at a rapid pace by triggering a button using your finger. This is an awesome way for kids to develop their motor skills and learn about cause and effect. The night spy toy enables kids to look up to 25 feet into the distance. There’s a 2x magnifying lens as well as a red light beam to make the image they see even clearer. This is a great toy for their observational skills. This spy set has so many options available that provide your child with more than just a fun toy set. It also enables them to learn about cause and effect, while developing their observational and motor skills too. 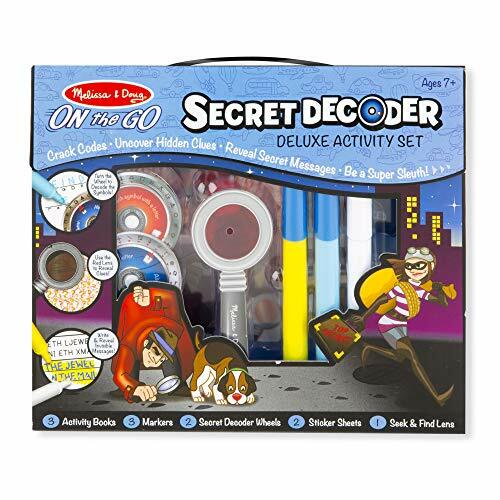 Melissa & Doug’s On the Go Secret Decoder Deluxe Activity set comes with magical reveal sticker sheets, as well as a secret message pad for the activities. There’s also a decoder book available which kids use to try and figure out the various codes. With over 50 different activities available, you can be sure that your child is able to play with this set for a long time. There are many different codes for them to figure out which is excellent for their critical thinking skills. Moreover, the secret message pad and magical reveal sticker sheets are great for encouraging more creative play too. We liked how this toy set helps kids to develop their critical thinking skills. However, there are also elements that ensure it always feels fun and creative to play with. 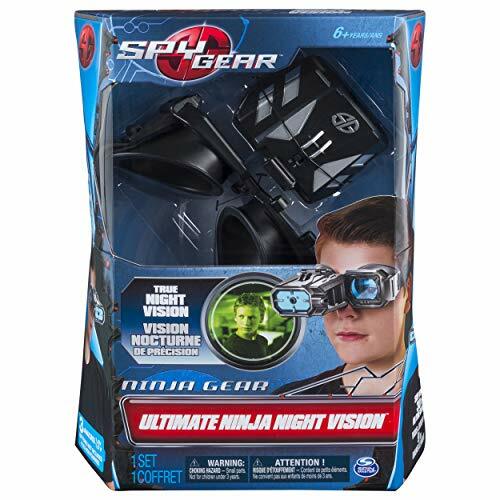 This Spy Gear Ult Ninja Night Vision toy set provides children with the ability to see a maximum of 30 feet in front of them while in the dark. This can be a lot of fun and makes them feel like they’re on an undercover mission. As a result, we found it to be effective at encouraging more imaginative roleplay games. You can even flip on the infrared attachment that comes down over the top of the goggles to turn the night vision mode on. Kids love having this option to switch between regular and night vision. They’re also given the chance to change between long or short-range modes. This can be effective at helping them get a closer look at their “targets”. An instruction guide is included to make the goggles super easy to use. These spy goggles enable kids to have more freedom to switch between regular vision and night vision which is a lot of fun. It’s also fantastic for stimulating their visual senses in a unique way. The SpyX Lite Hand toy enables kids to use their hands as a source of light. It’s a pretty unique and fun spy toy that enables you to light up darker environments by using your hand. Kids have been having a lot of fun playing around the house when it’s dark with this one. There is a total of 4 LED lights built-in which work effectively to brighten up a dark room. Children are able to play with a lot of imagination with these lights. There is also a feature that enables you to set the lights to flash with different patterns. This is super fun and incredibly stimulating for your child’s visual senses. This light has an elastic strap which enables your child to use it comfortably. The only issue is that your child won’t want to take it off! Kids have an absolute blast running around and lighting up dark rooms with this light source attached to their hands. The flashing mode is especially great for their visual senses and helps them to play with more imagination. 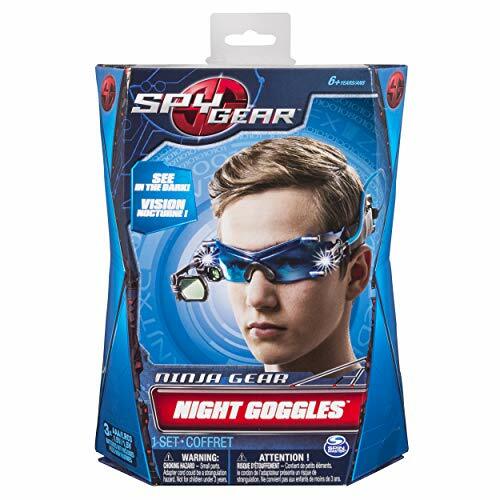 These Spy Gear Night Goggles are awesome for enabling kids to see clearly in the dark. 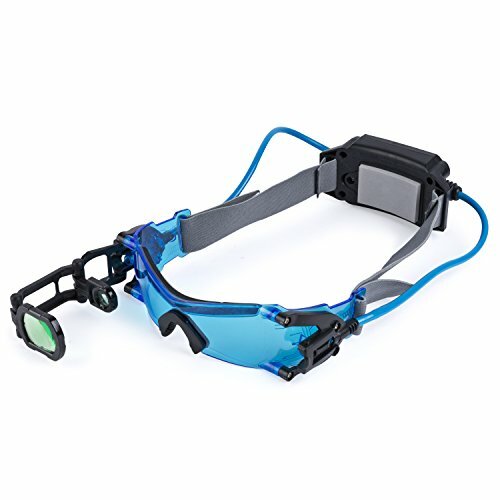 There are LED lights that shine brightly built-into these goggles. Furthermore, they have included lenses that have a blue tint to help you see in the dark with even more clarity. These features make the goggles incredibly stimulating for your child’s visual senses. Moreover, there is a scope that can be folded out which allows for more exciting play options. Not to mention, a lens that has a magnifying power of 2x is available to help kids see their targets even clearer when it’s dark. Kids are loving how they can zoom in and choose between the blue tint lens or LED lights to see their targets clearly at night. All these factors are great for their eyesight and encourage more creative play. This SpyX Spy Tracker toy is able to detect any movement that’s up to a maximum of 75 feet away. We found this to be an impressive distance that enables kids to set the tracker up at further distances. The set comes with 2 transmitter pods which have an easy-to-use wireless design. there’s also a base for the alarm available too. We liked how you can choose to use the alarm as either an LED flashing light or a sound. The LED lights are very stimulating for your child’s visual sense. Moreover, the sound of the alarm is great for their auditory learning skills too. Whenever it’s triggered by movement, you have the choice over how you want it to be notified. Kids love this as it ensures that they have more options to play around with and be imaginative. Parents may end up using it more than the kids! We liked how kids are given the option to make the toy active with either LED lights or an alarm sound. It gives them more playing options which encourage creativity. Not to mention, their sensory abilities are stimulated as a result too. The Secret Agent Spy Ear Piece Prop by Forum Novelties is a super fun toy that kids have been having a lot of fun with. It’s an accessory enables kids to put the earpiece into their ears and pretend to communicate. It doesn’t actually work, however, we found this to be a benefit. This is because it encourages your child to play with a lot more imagination. They can create various scenarios where they can incorporate the earpiece. The earbud has a very realistic design as it’s clear and very easy to blend in so that people don’t notice it. We liked how you can clip one end of the earpiece to your clothing while the other piece stays in the ear. It gives off the realistic and technological effect to make it seem more real for kids. As a result, it’s great for roleplaying. 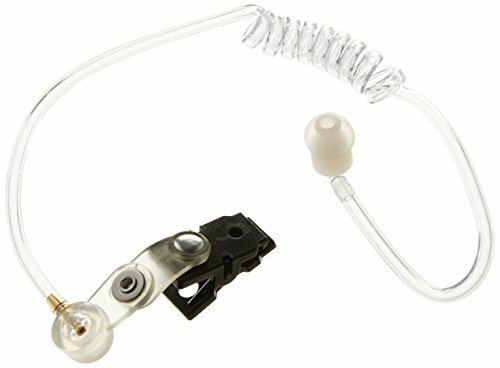 In fact, this earpiece toy is a great option to use in combination with a spy costume. We were impressed with how realistic they’ve made this earpiece. It helps kids to really get into their role and play with a lot of imagination. 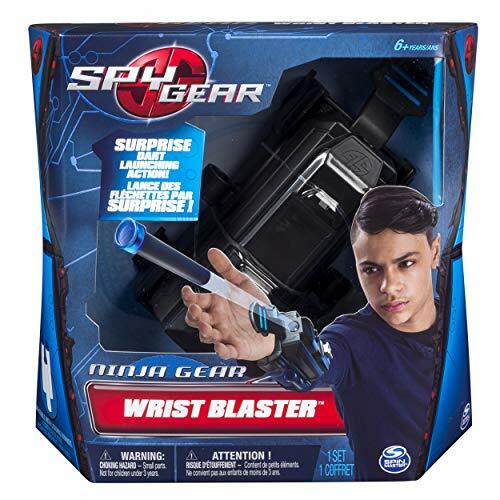 This Spy Gear Ninja Gear Wrist Blaster is an incredibly fun toy. You wear the blaster on your hand and can shoot out play darts to take your enemies down in silence. This shooting feature can be activated by pressing the trigger with your finger. We found this to be an effective and fun way for children to develop their motor skills. It also teaches them about cause and effect. 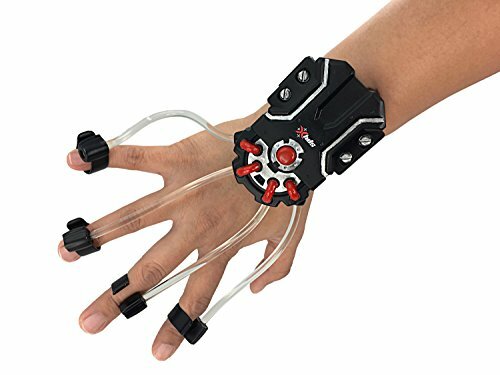 This wrist blaster can be part of a collectible set where there are spy cameras and various toy weapons available. Therefore, your child can add to their spy collection over time. Children love shooting out the play darts with this blaster and pretending like they’re on covert missions. It’s an entertaining way to develop their motor skills and help them grasp the concept of cause and effect. The SpyX Lazer Trap Alarm comes with a total of 3 pieces which kids can use in conjunction to create the ultimate trap that’s invisible to enemies. We liked how you’re able to adjust the trap a total of 360-degrees around as it provides you with more creative freedom. You can set up the traps around various items and places. Children are also able to have more control over how they want the alert sounds to be made. When it’s triggered, it can either alert them with an alarm sound or flashing lights. These are fantastic for developing your child’s sensory skills. 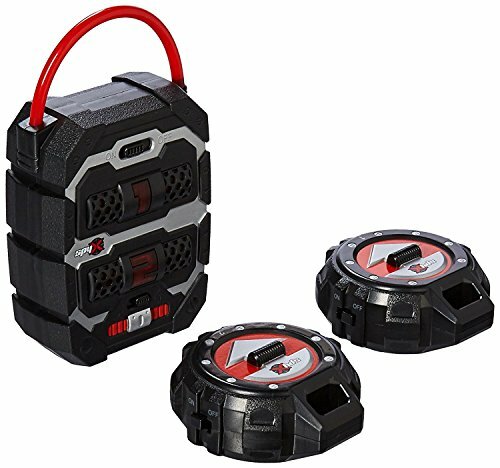 We were impressed with how the receivers can work up to a maximum distance of 4 feet apart. This allows you to set them up around a wider variety of items with ease. Kids have been having a lot of fun with how they’re able to set up these invisible laser beams around a variety of items. It gives them creative control and when the alerts go off, their sensory skills are stimulated. 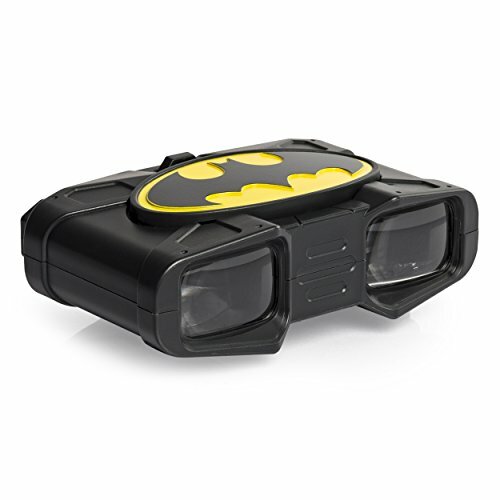 Spy Gear’s Batman Night Scope is a fun spy toy that children can use to see better in the dark. There’s a lock system located on the Batman symbol which enables you to use an LED spotlight to see even clearer in the dark. This is a very interactive and fun feature which kids love to activate. The LED spotlight is also a fantastic way to develop their visual senses. Not to mention, the lens available enables you to look through the night scope with a magnifying range of 3x for more clarity in the dark. An instruction guide is included to make the night scope super easy for kids to use. The Batman design encourages kids to play more imaginatively. Moreover, this scope is awesome for their visual senses. Melissa & Doug’s Spy Role Play Costume Set is an incredibly fun set that kids can use to roleplay with. 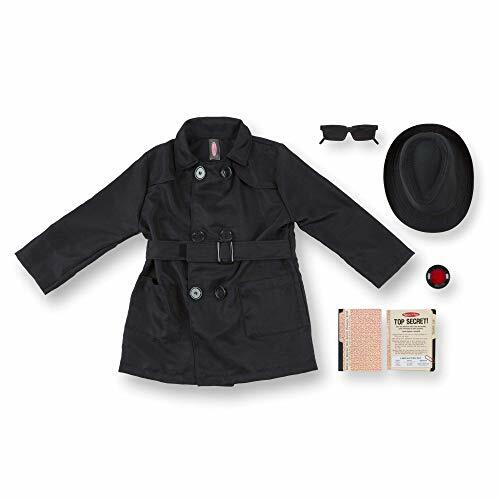 It comes with a spy jacket that’s black in color, as well as a spy guide, decoder lens, a message card with a secret code feature, a hat, and even rear-view mirrored sunglasses. All of these items combined are incredibly effective at encouraging kids to play with a lot of imagination. It ensures that they feel like a real spy which means that they can really get into the role and have a lot of fun. We liked how all the materials used are of a high-quality to ensure that the costume remains durable. Parents have been impressed to find how this costume set comes with so many accessories. Each one of them helps kids to feel like a real spy detective to play with plenty of imagination. 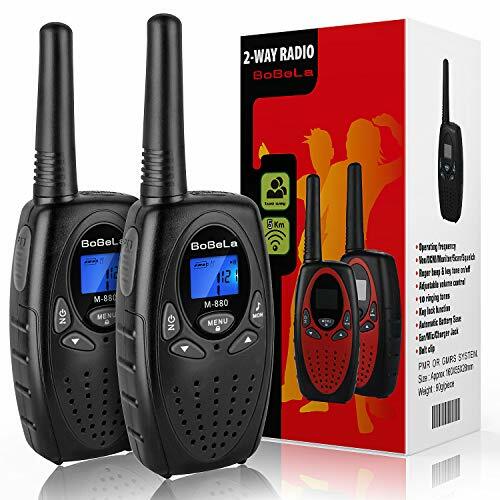 The Bobela Two Way Radio is small in size and super lightweight. As a result, it’s super easy for kids to carry around and play with. Parents have been liking how it comes with an automatic system that lets you know when the battery is getting low. This two-way radio has auto scanning, auto monitor, memory, noise reduction, and even voice activation settings. These are a lot of fun for kids to play around with and communicate with each other. Children are able to create their own roleplay games while using these radios to feel like a spy. This is great for encouraging more creative play. We also liked how the walkie-talkie enables parents to speak to all children at once. With so many different technological functions to use, kids are given the chance to play around with them and have a blast. As a result, their imaginative side is able to run wild. MaleDen’s Invisible Ink Pen enables you to write messages which turn invisible as soon as you’re done writing. However, there’s a light located on the cap which has an awesome blacklight feature. This enables you to clearly see the written message. Kids find this to be a lot of fun and it’s also great for encouraging them to develop their writing and reading skills. Their imaginative play side is able to flourish with this invisible ink pen. They can use it in their pretend scenarios to write out spy secrets. Moreover, parents can be assured of their child’s safety with this toy pen due to how it’s free from any harmful components and doesn’t produce a smell. Users have nothing bad to say about these pens! We liked how this invisible ink toy pen encourages kids to play with lots of imagination. It’s also fantastic for improving their writing and reading skills. 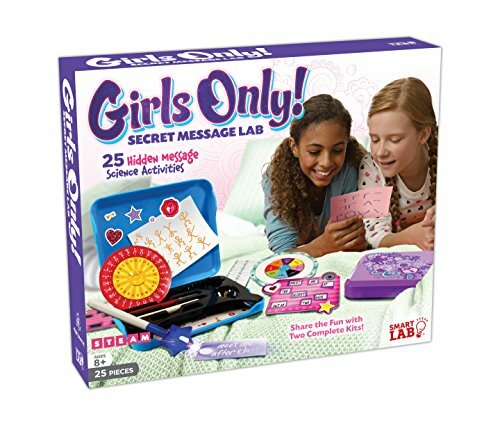 This Secret Message Lab from SmartLab is a set that your little girl is bound to love playing with. It enables them to keep their secrets safe by writing them down using the invisible ink pen. These messages can only be seen under special circumstances with the lab, which kids find to be a lot of fun. This also helps them to play with more creativity. We liked how they’ve included plenty of materials to ensure that two girls can use this set to play together. As a result, your child is able to improve upon their social skills too. Your little girl is able to use this Secret Massage Lab to play with a friend. This is awesome for their social development. Furthermore, writing down the secret messages is great for their reading and writing abilities too. 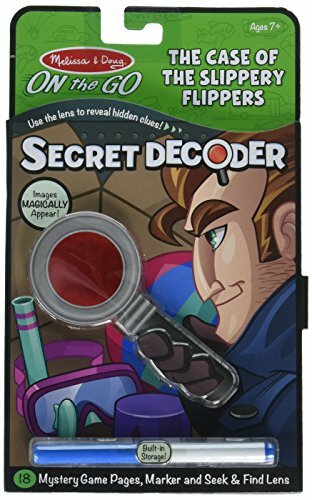 Melissa & Doug’s On the Go Secret Decoder – Case of the Slippery Flippers playset is tons of fun. It comes with a total of 18 pages that include various mysteries and puzzles for your child to solve. They provide you with an invisible pen, a lens for decoding, and a spy pen which is plenty for your kids to have fun with. We liked how solving the various mysteries and using the accessories provided encourages your child to think more critically. Furthermore, it helps them to play with more creativity to find the clues and solve the case. With so many mysteries available to solve, you can be sure that they’ll be engrossed for hours on end. Your child’s problem-solving and cognitive abilities are improved as a result. Children have so many mysteries to solve while using the great spy accessories included to keep them busy for hours. As a result, their ability to think critically and use their problem-solving skills are put to the test. Playco Products’ Walkie Talkies for Kids comes wit ha digital design that enables children to use the 3 different channels available. It’s super easy to set up and they can get themselves on the right channel with no issues after a little practice. This is great for their cognitive skills. 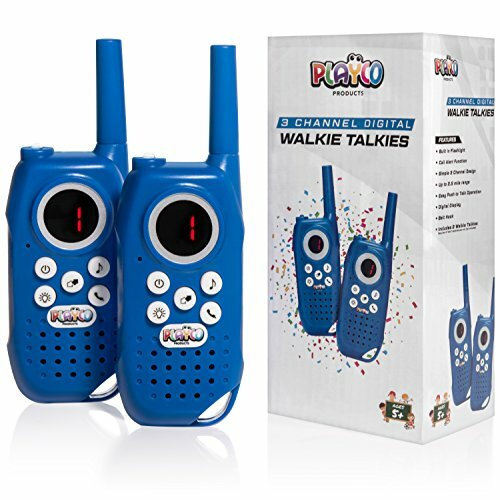 Kids love playing together and using these walkie talkies to communicate over long distances. To be exact, they come with an incredible range of up to 2 miles! Therefore, your children are able to play and communicate with freedom. This is a great feature that helps them to be more social too. Children have been liking how they’re able to create their own spy scenarios while using these walkie talkies. As a result, it encourages them to be more imaginative. There’s even a flashlight built-in which is great for night time and stimulates their visual senses. We were impressed with how the 2-mile range gives kids plenty of freedom to talk over the radios and create their own spy stories for imaginative play. Learning how to use the right channels for the walkie-talkie is great for their cognitive skills too. 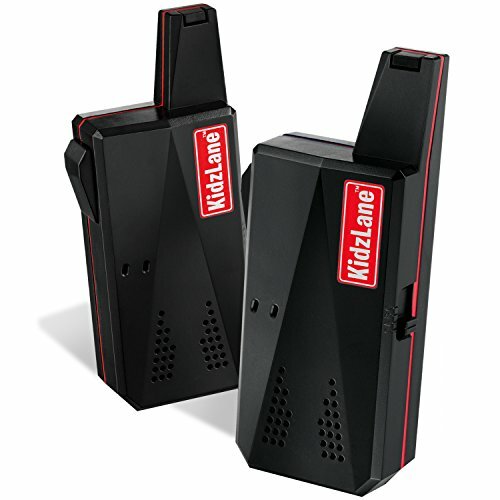 Kidzlane Kids Walkie Talkie comes as a set of 2 which enables your child to play with other kids. This is fantastic for their social development. We liked how these walkie talkies enable kids to create a wide range of spy scenarios which they can roleplay with. It’s awesome for their creative side. There are LED indicators available which are visually stimulating. A clip-on belt is also available which allows kids to effortlessly attach the walkie-talkie to them as they run around. Children are given an impressive range of up to 2 miles as well as 3 different channels. This is plenty to ensure they can play as freely as they like. Parents have also been liking how the batteries can last for up to 9 hours when on standby. Kids love strapping this to the clip-on belt provided and using it during their pretend-play scenarios. It gives them a lot of freedom to play as creatively as they like, which also improves their social skills. 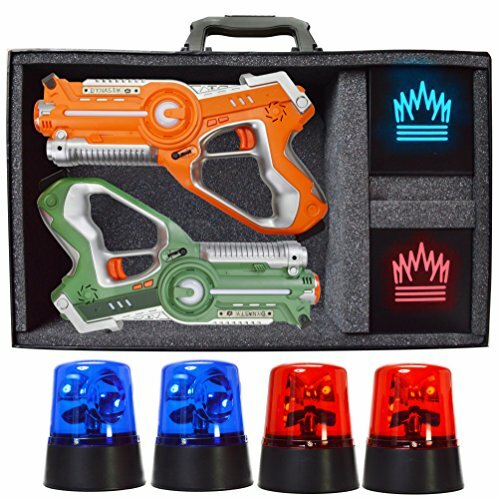 DYNASTY TOYS’ Laser Tag set comes with two blasters, 4 base lights, and 2 team cubes. Therefore, it’s an awesome way for kids to create their own spy scenarios in groups. This encourages more creative play and ensures children can develop their social skills. The blasters included have been made in a range of different colors to be visually stimulating for kids. Moreover, parents can have a peace of mind in knowing that all the lasers are deemed as completely safe for kids. 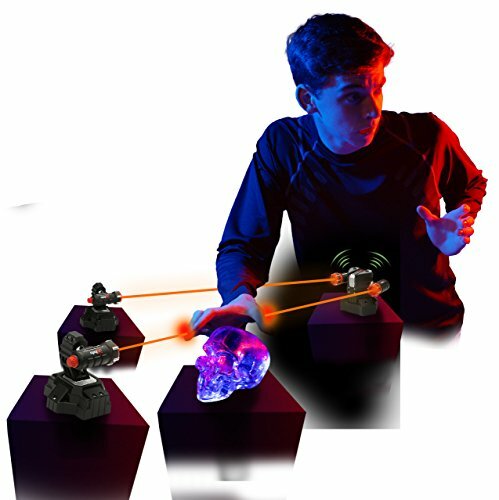 Children love getting together in groups and making up pretend-play spy scenarios while playing with this laser tag set. It’s also great for your child’s social development too. ALEX TOYS’ Undercover Spy Case Detective Gear Set is travel-friendly. Therefore, you can be sure to keep your child entertained while on the go. 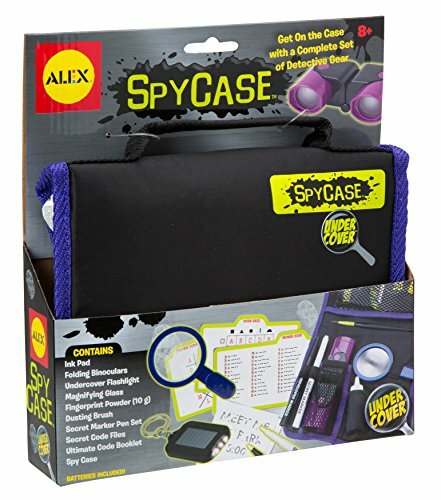 The set comes with binoculars, an ink pad, magnifying glass, flashlight, maker pens, fingerprint set, a booklet, and files of code. Therefore, you can be sure that kids have plenty of activities to be engrossed in for a long time. We liked how this set encourages children to develop their critical thinking and problem-solving skills too. The wide range of detective spy items included helps to make it feel more real which enables kids to play with more imagination. Children love being wrapped up in all the spy accessories that this set comes with. It makes everything feel more realistic, which is beneficial for your child’s creative play side. 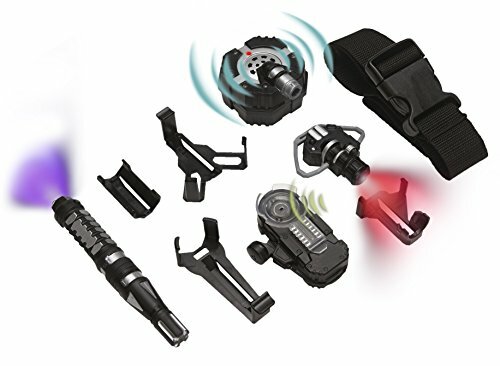 Spy Gear’s Video Walkie Talkies come with a unique 2-way audio and video communication feature. It enables kids to see and hear each other when they are a maximum of 160 feet apart. This allows them to stay in constant communication as they play around the house. We were impressed with how there’s 2-way communication as it allows for more natural speech between your child and their friend/sibling. The video communication aspect is especially impressive. It makes it easy for them to show each other certain things as they’re running around and roleplaying being agents. We found this set to be highly engaging an effective at encouraging more imaginative play scenarios. Not to mention, it’s stimulating for your child’s visual and auditory learning senses. 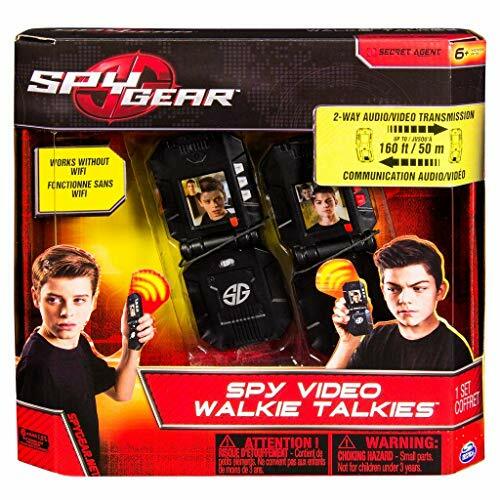 Kids love pretending to be spies on a mission and being able to communicate with each other via the 2-way audio and video communication system. It’s fantastic for their imagination, as well as their sensory learning skills. These Walkie Talkies by Spy Gear come with an impressive range of up to 2 miles. This provides your kids with a huge range to play with and be more imaginative with how the scenarios they create. We liked how they’ve designed these walkie talkies specifically for kids as they’re super easy to use. All you have to do is click and hold a button to communicate. This communication and playing with other kids is also great for developing their social skills. 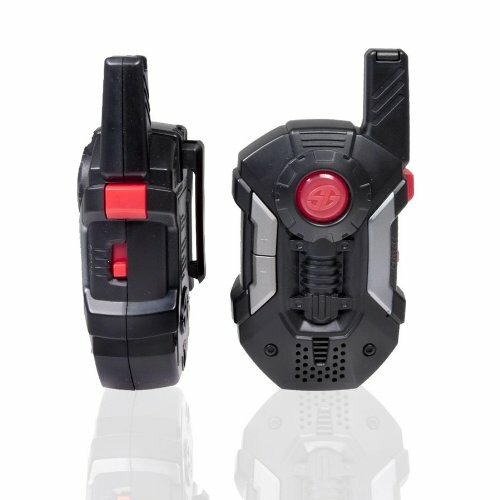 Moreover, kids have been liking the black design of these walkie talkies as it fits right in with the spy theme. Kids are loving the long range with these walkie talkies as it allows them to play with more freedom and create tons of different roleplay scenarios. Communicating with the walkie-talkies is easy and develops their social skills too. 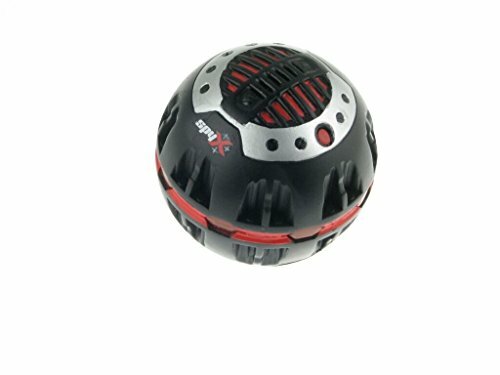 This Voice Bomb Recording Ball comes with a fantastic motion alarm detector which is activated whenever there are any intruders near it. This is a lot of fun as it enables kids to detect if anyone is getting close to the secret message that they’ve recorded. You’re able to record messages that are up to 10 seconds in length. This is a lot of fun and encourages kids to come up with elaborate pretend-play scenarios which are great for their imagination. You can also playback the message and listen to it through the loudspeakers that are provided. We found this to be effective at helping your child develop their audible learning skills. This is a unique spy toy which kids can use to record secret messages and be warned if anyone’s getting near them. This promotes their creative play abilities and can improve their sensory skills too. 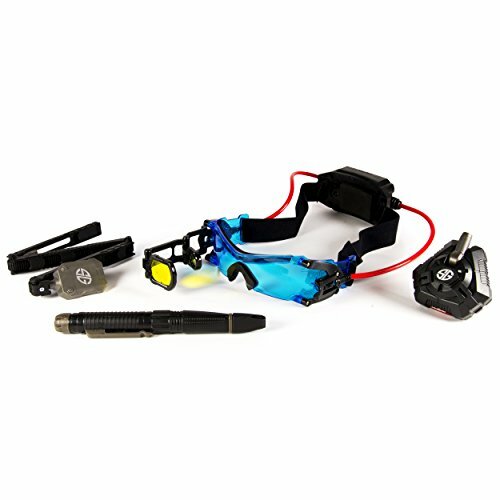 These Night Goggles by Spy Gear have been designed with 2 LED lights that are built-in. There are also lenses that have a blue-tinted design which makes it great for improving how clearly you can see at night. In addition to this, there a magnifying lens that can zoom in up to 2x. All of these features are fantastic for ensuring your child is able to develop their visual learning skills. We liked how they included a scope that has a flip-out design. It gives kids more options with how they want to see things at night and is fun to fold out and fold back in. This can be great for encouraging your child to play with more creativity and make up pretend spy scenarios. Kids are loving how they’re able to clearly see ahead of them in the dark and have their visual senses stimulated. It’s also a great way to play spy games with more creativity. This Spy Guy Secret Mission Set comes with a great pair of binoculars. Kids love using them to see into the distance with more clarity and they can incorporate it into their roleplaying spy games easily. We liked how you can simply flip the switch available to decide whether you want to look towards the left or right. Not only is this visually stimulating, it can also improve your child’s coordination abilities. They’ve included a super fun disc shoot toy accessory too. it comes with a total of 3 discs which kids can use to shoot out at their enemies. This is great for developing their motor skills as well as teaching them about cause and effect. Kids have been having a blast using the binoculars and disc shooter to play with more imagination in their spy roleplay games. This set also helps to develop their motor skills and improves coordination. So, those are what the 29 best spy kids toys for boys and girls have to offer. There are a lot of different options available, therefore, you may still be feeling a little unsure as to which one is the best for your child. If this is the case, don’t worry. We’ve created a buyers guide section just below to help you learn some more details about these toys. As result, you’ll be well on your way to picking the best spy toys for your kids. Prior to committing to a purchase, there are some important factors to take into consideration. This is because these spy toys have a number of developmental benefits for your child. To learn more about what these involve, have a quick read below. One of the biggest edcuational and developmental benefits that your child can gain from playing with these toys is that their imaginative side is able to run wild. 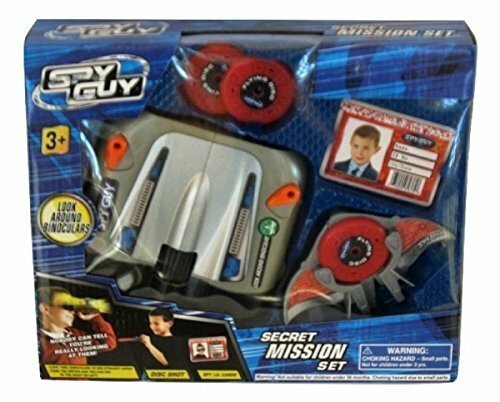 These spy toys provide your kids with the ability to roleplay spy games and create their own stories while using the toys to enhance the experience and make it feel more real. This is incredibly important for your child’s development as it can improve their ability to think outside of the box and solve problems. Many of the spy gear toys for kids in our review are best when at least two people are playing with them. As a result, your child is encouraged to play with other kids and be more social. Children can get together and come up with new and exciting spy games to play. As you can see from the review above, there are many different types of spy toys for kids. We understand that it can feel a little overwhelming, which is why we’ve created this section to help you out. We’ve laid out information surrounding the various kinds of spy toys to make it easier to see the differences between the ones mentioned in our review above. There are many spy kits available online, as well as in our review above – and for good reason. Spy kits provide your children with more than just a fun spy game. They tend to include different mysteries and puzzles. Therefore, your child has to recruit their critical thinking and problem-solving skills to get to the bottom of it. These kits are awesome for keeping your child engrossed in their game for hours on end. They usually include various accessory spy items to make the experience more realistic for kids. We have included spy toys for girls in our review as they may prefer certain kinds of toys over the ones that are traditionally made for boys. Having said that, many of the spy toys above are fantastic for both girls and boys to play with. The spy toys that are specifically for girls come with the more vibrant colors, such as purple and pink, which makes it more enticing for them to play with. Initially, walkie-talkies may not seem like a spy toy. However, once you realize how imaginative kids are able to get while playing with them, you’ll quickly see how they help your child become a little spy. Kids can communicate with each other to send messages and come up with various play scenarios to play creatively. The ones discussed in our review come with impressive ranges which provides children with more freedom to play creatively on the covert missions. Spy cameras can be a lot of fun for kids as they can use it as a device to capture footage. It’s a fantastic way for them to play with more imagination. This is because they can record things secretly and make it a part of their roleplaying game. 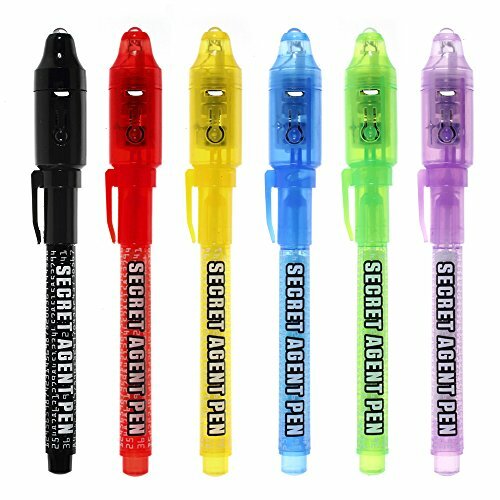 Spy pens are a ton of fun to play with and have some incredible educational benefits for your child. We liked how they can write secret messages that no one else can see apart from them when they use a special light or piece of paper. It’s an awesome way for them to pass and receive secret messages and roleplay what it’s like to be a spy. While kids are having a lot of fun using these spy pens, they’re also developing their writing and reading ability. Having a spy outfit is a child’s roleplaying dream. This is especially the case with the costume set that’s available in our review above. It comes with a number of fantastic accessory spy items that help your child get into the role and feel like a real spy. It’s the ultimate way to encourage your child to roleplay and be super imaginative. The spy kid’s sunglasses that we’ve reviewed are fun and visually stimulating for kids. Most of them come with a rear-view feature which enables you to see what’s behind you without having to turn your head. Kids have been loving how inconspicuous they can be while wearing them. They can easily implement these glasses into their roleplaying spy scenarios. The sunglasses also help to hide their identity if they’re roleplaying being undercover. Spy gear night vision goggles are incredible toys that children have been having tons of fun with. They can use them to see the way ahead into the distance during the night. The various lenses, magnifying power, and scopes available are all effective at giving your child a clear image from a distance. This enables them to play incredibly imaginative spy games when it’s dark. These kinds of spy goggles can also be easily used alongside other accessories, such as glasses and pens, for the ultimate spy roleplay experience. Now that you have a better idea of what the top spy kids toys for boy and girls have to offer, you can begin to find the ones that are best for your kids. Be sure to consider their age and how they like to play. These toys are especially great for helping your child to become more expressive with how imaginative they can be. Use our buyers guide section just above to provide you with some more clarity on these spy toys. Hopefully, we’ve given you all the info you need to go and choose the best toys for your little spy!